A reader takes me to task for making comparisons between the Brexit negotiations and the Allied invasion of Normandy, suggesting that I am wrong to present the negotiations as a conflict between the parties. Yet it is precisely because Mrs May seems to have chosen an adversarial route rather than a consensual process that I have projected her failings in militaristic terms. If she was going to treat the EU as the "enemy" then she needed to take heed of the rules of warfare and act accordingly. In reality, it would have been best to approach the Brexit process not so much as the end of a relationship as a redefinition, where the need to continue close cooperation continues, even if it is to be structured on a different basis. As such, the negotiations would best have been approached on the basis of the two parties seeking a solution to a common problem, cooperating on defining how best we could work together in the future, with each party recognising mutual constraints. Here, though, lies the essential problem. The EU, as a treaty-based organisation, does not have the flexibility to change its own rules just to suit the needs of one member, and especially one which is seeking to leave the Union. Yet, on the other hand, the UK government has political constraints which prevent it making concessions which would allow the EU to define a new relationship. That, effectively, creates an insolvable problem where Mrs May is caught between a rock and a hard place with very little room for manoeuvre. Yet, while one can empathise with the prime minister's situation, one must also recognise that the problems that Mrs May faces are entirely of her own making. If she had taken a pragmatic view from the very start, and understood that the EU could not accommodate her need for "frictionless" access to the Member State markets without the UK committing to continued participation in what has been called the "regulatory ecosystem", then none of her current difficulties would have arisen. But, having put herself in a position where she is demanding something that the EU cannot give, she herself has no alternative but to adopt an adversarial stance – if for no other reason than to show her own political allies and critics that she is doing her best to resolve an impossible situation. In so doing, though, she has made a difficult situation worse, in that the EU – already unable to respond positively to Mrs May's original demands – is unable to accommodate further demands for even more concessions. On that basis, since the prime minister's behaviour is to a very great extent adversarial, it is entirely appropriate to speak of it in militaristic terms and to draw comparisons with the Normandy campaign. She is displaying all the worst characteristics of a poor military strategist, making fundamental mistakes in the way she goes about the Brexit negotiations. 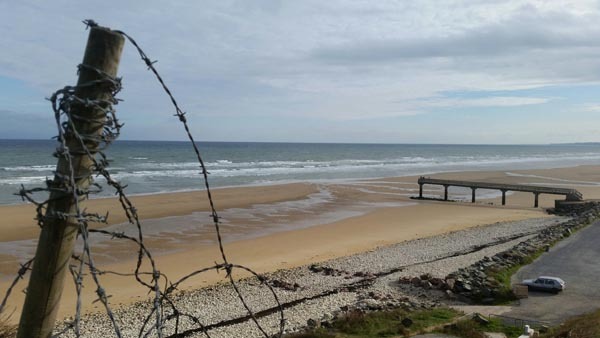 To that effect, we can draw another parallel, this one between Mrs May's current stance and planning for and the execution of the plan for storming Omaha beach in the American sector (illustrated above), the location of which we visited yesterday. There, troops were sent into an exposed position with inadequate preparation – the air and sea bombardment having failed to knock out the defences, lacking armour protection in the first, vital phase of the assault, and without the specialist combat engineering vehicles needed to clear the obstacles. As a result, the American forces took terrible casualties – entirely unnecessary in the view of many who have assessed the campaign. In this instance, however, the invasion forces prevailed – through the extraordinary courage of the survivors and with the heroic intervention of the destroyers, some of which closed to within 1,000 yards to engage with the German fortifications. There, of course, the parallel ends. Mrs May has defined the Brexit negotiations in adversarial terms, she has failed to plan adequately for the "assault" and has put herself in an exposed position. Now she is taking the diplomatic equivalent of withering fire, there is very little anyone can do to help her. Her position is untenable and there is no equivalent of counter-battery fire which can help her. Where the parallel holds, though, is that it will be the "ordinary Joes" who suffer the effects of the failures. The effects of a bodged Brexit may not be measured in bloody corpses stacked on the beach, but the harm done will certainly have been as avoidable as the casualties of 6 June 1944. I will be back home tonight – doubtless very tired – but hope to blog briefly. Normal service will be resumed over the weekend, free from military analogies.